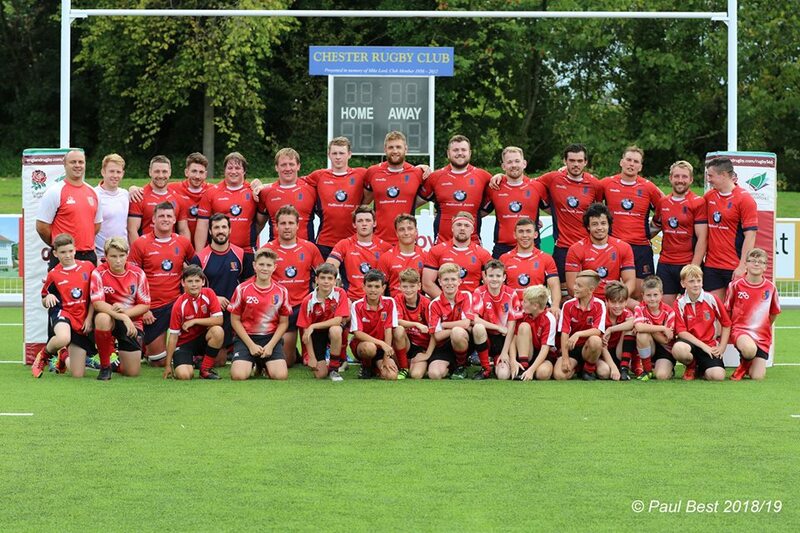 In the end this was an easy 5 try bonus point win for Chester, but it was one which was never quite so straight forward as the score line suggests writes Des Hickie. Neither side was ever really secure in its lineout play. A strong, gusting wind made the hookers’ throws a little uncertain and led to a lot of tapped ball. At the same time Otley’s scrum tended to have the shove on their opponents. How then did Chester win well despite some less than perfect set piece ball? Arguably it was mainly down to their work rate and intelligence in defence. It was no accident that Otley failed to register a point. They never really looked like scoring a try, and when they did manage a break, the home defence scrambled and reorganised far too quickly for them. Conversely, Chester had the attacking ability to create scoring chances and to take a high percentage of them, especially as the game progressed and the visitors tired. In many ways the early minutes encapsulated much of what was to follow. Otley had territory and applied pressure, with handy breaks by the open side and left wing, but both attacks fizzled out without threatening the try line. Chester replied from a scrum near their own line. Guy Ford picked up at No.8 and fed fullback Sean Green on his right. Sean broke almost to half way before passing to scrum half Josh Morris, who covered the remaining 50 metres to the try line but just failed to get the touchdown. This was merely the first of a series of excellent long breaks Josh made in an irrepressible running performance, despite sometimes working behind a retreating scrum. Minutes later Sean was involved again, narrowly failing to score from a sweeping move that began from a lineout just inside the Otley half. Chester’s breakthrough came in the 18th minute from another lineout, this time just inside the Otley 22. The ball was moved quickly right to Sean in midfield. He stepped left aginst the drifting Otley defence and found winger Harrison Vare on his inside. Harrison scored and James Robins converted. Then, just on half time, Chester made a second breakthrough, this time from the pack which drove Alick Croft over from a 5 metre lineout for a 12-0 lead at the break. Ten minutes into the second period Mike Craven stretched the lead to 19-0 from an Otley defensive lineout 5 metres from their own line. First, Mike snaffled the ball when the visitors failed to secure it then, three pick and goes later, he was on hand to cross for the try. The next 20 minutes was punctuated by a series of knock ons from both sides. Otley did have probably their best attack of the afternoon, when their forwards carried repeatedly form a 5 metre lineout, but never really looked like making it count on the scoreboard. By now the result was pretty much clear, but in the last ten minutes Chester conclusively settled matters with two tries that secured the bonus point. In the 70th minute Harrison Vare completed a patient build up from a lineout 40 metres out, crossing in the right hand corner for a well worked try. Harrison was involved again two minutes later. This time he charged down an attempted Otley clearance deep in their 22 and centre Tom Foden gratefully picked up the bouncing ball to score the try. In some ways this try summarised much of Chester’s afternoon, with Harrison and Tom working hard to chase down a kick, forcing an Otley defensive error, and capitalising on the opportunity.